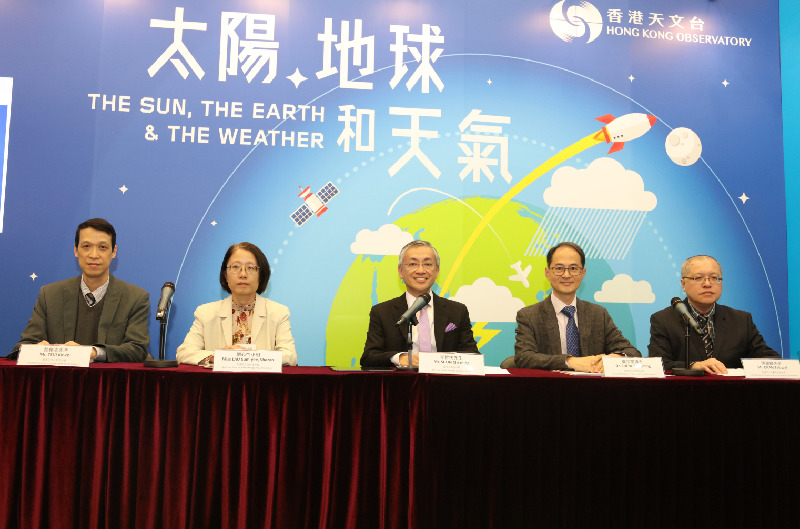 The Director of the Hong Kong Observatory (HKO), Mr Shun Chi-ming, today (March 21) hosted a press briefing in which he highlighted the HKO's upcoming initiatives, reviewed the weather of Hong Kong in 2018 and elaborated on the weather outlook for this year. Mr Shun and the Director of Agriculture, Fisheries and Conservation, Dr Leung Siu-fai, also officiated at the launch ceremony of a new book entitled "Climate Change and Biodiversity in Hong Kong" during the press briefing. Mr Shun said during the launch ceremony that the book, with photos showing damage caused by climate change, is the best reminder for the community to give practical support to mitigate climate change and to conserve biodiversity. Mr Shun and Dr Leung also took the opportunity to announce a collaboration plan between the HKO and the Agriculture, Fisheries and Conservation Department under which the two will work together to provide location-specific weather information at various hiking trails and locations through mobile phones from the fourth quarter of this year to assist hikers in planning routes. Mr Shun announced in the press briefing that two enhanced weather services will be made available to the public starting from today. One is the release of real-time wind direction and wind speed information from the automatic weather stations at North Point, Central Piers and Lamma Island on the HKO website with the aim of enhancing its regional weather information service. The other one is the launch of a new interactive webpage, "Earth Weather", featuring forecast weather charts from computer models, including wind direction, wind speed and temperature. Tropical cyclone forecast tracks will be added to the new website at a later stage. These two enhanced services will also be available in the "MyObservatory" app when the updated version of the app is in place. Moreover, to promote the theme of this year's World Meteorological Day, "The Sun, the Earth and the Weather", the HKO launched a new version of the "Space Weather" webpage, and added a kids version of the "Space Weather" webpage to the "My Little Observatory" website to enhance the public's knowledge on space weather. When reviewing the weather in 2018, Mr Shun pointed out that the World Meteorological Organization (WMO) marked 2015 to 2018 as the four warmest years on record globally, with 2018 ranked the fourth warmest year on record. Locally, the weather in Hong Kong was warmer than usual in 2018 with an annual mean temperature of 23.9 degrees. The winter between December 2018 and February 2019 was the warmest on record, with the mean temperature reaching 19.1 degrees. There were only three cold days this winter, the fewest on record. Although Hong Kong was severely battered by Super Typhoon Mangkhut last September, there were no fatalities. Mr Shun emphasised that the continuous trend of climate change warrants attention from the public. On the annual weather outlook for Hong Kong in 2019, the tropical cyclone season may start in or after June this year. It is expected that there will be four to seven tropical cyclones coming within 500 kilometres of Hong Kong, which is normal. Under the effect of global warming and El Niño, the annual mean temperature in 2019 is expected to be above normal, with a high chance of reaching the warmest top 10 on record. The annual rainfall is expected to be normal or above normal, which means Hong Kong would likely be affected by heavy rain. Members of the public are reminded to take precautions in a timely manner. To provide more accurate lightning information, the HKO established new lightning detection stations at Chek Lap Kok and Dongao Island in Zhuhai in 2018, with the latest model of lightning sensors installed. The sensors at the four existing stations, namely Chung Hom Kok, Tsim Bei Tsui, Sha Tau Kok and Taipa, Macao, were also replaced with the latest model. After trial run and optimisation, the new lightning sensors commenced full operation early this year. The HKO also plans to launch a new "Automatic Sea State Forecast" webpage in the coming typhoon season to provide 96-hour prediction of sea waves and swells in the South China Sea, the western North Pacific Ocean and the North Indian Ocean. Some progress was made in the provision of aviation weather services by the HKO. "MyFlightWx", the electronic flight bag weather mobile application soft launched by the HKO at the end of 2017, has been put on trial use for several months. Pending official approval from the Civil Aviation Department, "MyFlightWx" can officially be used in flights. Moreover, the HKO also plans to expand the Hong Kong Aircraft Meteorological Data Relay programme through installing new software onto 70 Boeing 777 aircraft progressively to provide meteorological data, including wind speed, wind direction, temperature and the newly enabled turbulence measurements recorded on the aircraft. These data enhance aviation safety and the accuracy of the global numerical weather prediction models. 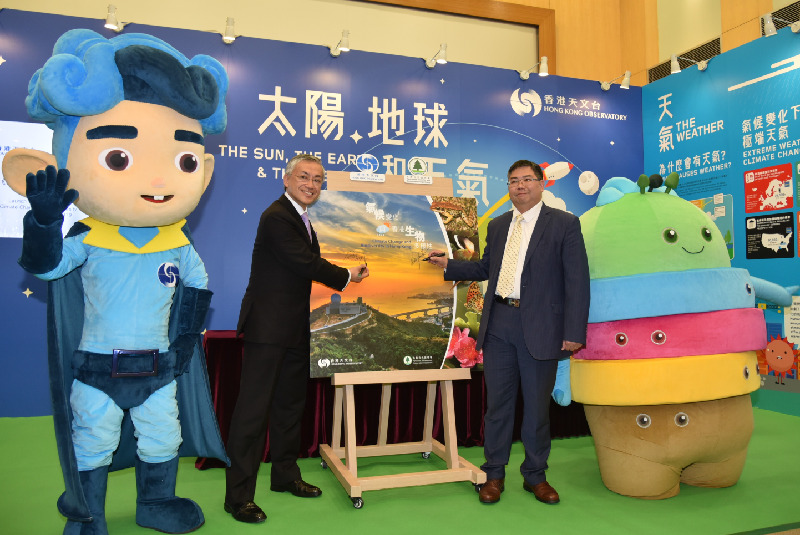 The HKO is also collaborating with the Airport Authority Hong Kong to provide weather information of more than 300 destination airports to travellers through the Hong Kong International Airport's mobile application in mid-2019. The relevant weather information may also be shown on the display screens at the boarding gates afterwards. Following the appointment by the WMO as the Regional Specialised Meteorological Centre for Nowcasting last year, the HKO was designated by the WMO as the Testbed for Doppler Light Detection and Ranging (LIDAR) systems for aviation application with the aim to promote collaborations in testing and developing standardisation of meteorological instruments among the meteorological service organisations around the world. The designation by the WMO is recognition from the international meteorological community of the HKO's application of LIDAR in the detection of wind shear, building wake and wake turbulence from aircraft. To tie in with the development of the Guangdong-Hong Kong-Macao Greater Bay Area, the HKO will upgrade the Greater Pearl River Delta Weather website currently operated by the HKO in collaboration with the Guangdong Meteorological Service and the Macao Meteorological and Geophysical Bureau in order to provide weather forecast and warning information covering longer periods with greater detail. The upgrade website will be launched in the near term. On public communication, with its Facebook page and Instagram account launched last year, the HKO will strengthen collaboration with various government departments, organisations and local artists to produce short videos and animations, which will be released through the HKO's Facebook page and Instagram account, to raise public awareness and knowledge on climate change. Last year, the HKO collected photos and videos taken by the public during the passage of Super Typhoon Manghkut through its Facebook page. Selected photos and videos have been put on the "Interactive Map of Storm Damage by Mangkhut" webpage (www.weather.gov.hk/cwsrc/index_mangkhut.html) for research and educational use. The HKO also plans to invite the public to provide information on weather phenomena that occur nearby through the "MyObservatory" mobile application in 2019 to enhance the coverage and content of weather monitoring. The public can also share and browse photos and videos of various weather phenomena through the application. The crowdsourced information promotes the development of weather services and smart city initiatives. The public can also better understand the weather situation around them. Lastly, Mr Shun announced that the annual Open Day of the HKO will take place on March 23 and 24. In addition to the prize presentation ceremony of the "1-Minute Weather" Time-lapse Video Competition, a series of performances combining elements of weather and art, including the launch of the new song "Climate and Life" on climate change jointly produced by the HKO and a local singer, will be featured at the opening ceremony on March 23. Members of the public are welcome to attend. Mr Shun's speech at the press briefing is available at www.hko.gov.hk/dhkovoice/speech20190321e.pdf.